River Hills Country Club's heated 25-meter swimming pool is the perfect spot for a personal workout or family fun. It is a great place to just hang out and relax or to socialize with your friends. 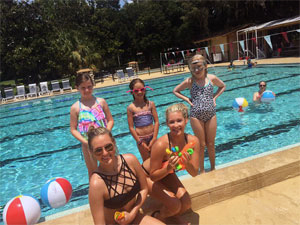 The children's wading pool is a fun and safe place for our youngest members under the watchful eyes of their adult guardians. Poolside service is available during The Legends Grill hours with a full menu and beverage service. River Hills is home to TBAC Brandon, a branch of Tampa Bay Aquatics. TBAY is a USA Swimming and Florida Swimming registered team and is recognized as one of the top 100 swim clubs in the United States. The swim team hours are posted at the pool and one lane is always open for Members during practice sessions. TBAC Brandon offers private swim lessons year-round for children 3 years of age through adult. Instruction is available for learning how to swim through stroke and technique assistance for Masters Swimmers. The swimming pool is open daily year-round.